Hammocks and hammock camping have seen prolific growth as more people see the benefits of getting off the ground for a good night’s sleep. This guide will help you find the best hammock tarp for you. The surge in demand for hammock camping gear has led to more manufacturers, from cottage industries to the biggest names in camping, jumping on board to cash in on the craze. There are dozens of companies making tarps and a number of models produced by each company. So how do you know what tarp is best for you? Hopefully, this guide will help you decide before you spend your hard earned money. Over time tarps have become a 4-season camping aid. You never know what kind of weather and conditions you may face. Like a sleeping bag, no tarp is universal and different styles and cuts may be better suited to different locations. Consider these guidelines based on the conditions you’ll be facing. A tarp can be as simple as an upgraded poly tarp you might use to cover a car. Tarps are also made from lighter super-nylon materials. Some ultralight tarps are made of Dyneema fiber which is incredibly strong and lightweight. Keep in mind that costs increase as you move to lighter materials. The corners and along the edge a tarp will have tie-out points or grommets to attach to your stakes. The location and number of grommets will have some effect on the way you hang your tarp. To keep everything tight, you will need more than 4 corner tie downs. On construction, the more stitching the better. You’ll also want to look for reinforcement points around any tie-outs. Generally, grommets are thought of as weak points, especially if a reinforcing layer of fabric is not used. Most hammocks are between 9 and 11 feet long so you will need a tarp long enough to cover that span. When deployed, a hammock sag in the middle. So, it won’t measure it’s full extended length when hung. You can count on it being between 75% and 95% of that distance. A good rule of thumb on length is to get a tarp that is at least as long as your hammock before hanging. A little longer never hurts when it’s pouring rain. It very wet scenarios, you’ll be grateful for every inch..
Width will greatly depend on your tarp’s cut and what weather you will be using it in. Wider tarps can be hung lower to keep out wind and provide some privacy. If you want full coverage, aim for a width that is 80% to 90% of the length. Smaller, lighter tarps are available for camping in more temperate conditions when the weather will be fair. There is a risk to using these if things if the weather turns south but they are far lighter. You will commonly find tarps in 6 styles and with a little variation between producers. – This the most common cut of tarp that is a simple rectangle with at least 4 tie-out points around the edges. Most have more tie-outs for a better and tighter shelter overall. These are the most affordable but least efficient tarp. –These tarps are longer across the ridge than at the edges making them a somewhat hexagonal. This puts more tension on the sides for a more secure shelter and making them weigh less. They may cost as much as a rectangle tarp, even a little more and are very popular. – Similar to a rectangle or hex tarp but with at least 6 tie-outs along the length and swooping cuts between them. This saves a little weight but the primary purpose is to put extra tension on the tarp so it hangs tighter. These are efficient and popular. – These are diamond shaped with the farthest apart tie-outs serving as the ridge. These are more of a rain-fly and provide the least coverage. However, in fair weather, they are much lighter and are quite popular for seasonal hammockers. – A modification of the diamond or rectangular cut, these tarps are much like diamond cut tarps but with slightly more coverage. Some can be hung as a rectangle in a pinch. Popularity on these was very high but is waning. – Tarps specifically designed for maximum wind and weather protection are usually a rectangle or cat cut tarp. They will have additional grommets as well as edges that are longer than the ridge. This allows the end flaps to fold in as doors. The best of these will have the option to fold the doors back to convert into a hex tarp for summer. They use the most material so have the highest weight and cost. Don’t forget to check out my hammock underquilt article. Hammock underquilts are great for staying warm and cozy in your hammock. Because of long shipping/construction times and possible variations in quality, we will be focusing on the easier to acquire and cost-effective production models. 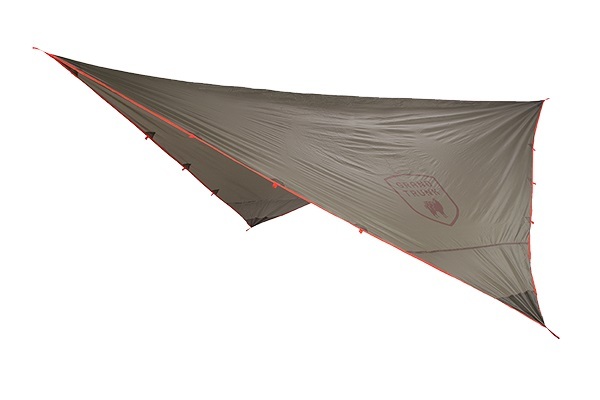 If you want coverage, this 10’6” tarp weighs only 22 ounces and offers incredible protection. It’s modified cat cut design keeps the tarp tight in the wind and helps block out the chilling breeze on cooler nights. Great from Spring through Fall, this has been a well loved and bestselling tarp for years. Polyurethane treated ripstop nylon holds up well and keeps out even the worse rain. It could be a tad longer but when hung correctly it provides sufficient protection. Comes with reinforced tie-outs and a built-in stuff sack. Measuring 12’ across the centerline, this hex cut tarp provides plenty of cover up top. The sloping sides keep things light at just 27 ounces. It falls just outside of ultralight range but packs down to a small cylinder about the size of a pop can and about 10 inches long. In this small space, you get premium coverage. Made of ripstop nylon and treated with a polyurethane to keep you completely dry, this is a current favorite in production tarps. For a production tarp, it does a superb job. Measures 12×10’ with reinforced tie-outs and corners. Hangs tight and keeps you covered. Stuff sack included. For maximum protection this 13×13’ tarp from Double Diamond does the trick. It has plenty of room and even more versatility with 16 reinforced tie-out points. As a perfect square, running this tarp from your ridgeline to the ground to keep out the worst weather makes it a great choice. Not a lightweight option at 2.5 pounds, you have to want to carry it for it to be worthwhile. When camping in storms, this is the best tarp on the planet. For clearer weather, a lighter tarp is a very welcome choice. Polyester with polyurethane treatment for waterproofing. Stuff sack included. The HouseFly is exactly what you would imagine, a tarp that can serve as a home away from home with ultimate 4 season protection. Nearly 11’ across the ridge and 9’ wide, this winter tarp is cat cut with doors on both sides. No rain, little wind, and pure comfort await inside. All of the Poly-treated nylon means this is not the lightest option, weighing about 2 pounds. You can use it year round but really shines in winter. 8 tie-outs allow you to use in door mode or open it up in warmer weather. Attached stuff sack included. The Fortress by Chill Gorilla is a house of a tarp that works year round if you want to carry the 2-pound tarp around. Longer than most tarps this size, you get a 12-foot ridge that can be used as a hex tarp in warm weather or completely sealed in the winter. Made of premium ripstop nylon to keep it as light as possible for all the fabric. Completely waterproof and windproof, this U.S.A. made tarp is a great choice. Comes with reinforced nylon tie-outs, guy lines, stakes and a stuff sack for a complete, ready to use kit. For a perfectly usable hex tarp, it’s hard to beat the ENO ProFly with its 10’6” ridge and lightweight polyurethane treated nylon construction. While it’s better suited to the shorter ENO style hammocks, it can serve well for some longer models. 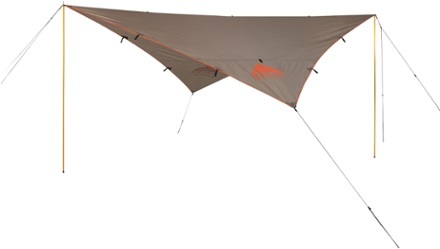 In total, this tarp weighs less than 1.5 pounds and is among the lightest production hammock tarps on the market. While this is a hex tarp, it does have cat cut sides to keep it tight. It does a great job of keeping the weather out for 3 season camping. Comes with 6 tie-out points to keep it secure in windy weather. This was my first quality tarp and one enjoyed using. Comes with attached stuff sack. <p>Construction is of sylnylon with a DWR waterproof coating for maximum protection. All of the tie out points are reinforced with extra reinforcement in the corners. Made in the U.S.A and shipped with an included stuff sack, stakes, and guy lines. Ready to go out of the box and amazing quality. There is no doubt that Kelty knows camping and lightweight gear and it shows in their cat cut, diamond rain fly. It’s available in 9 or 12 feet. For hammocking you want the larger for excellent protection from lighter rain and bad weather. It’s versatile enough to use in a variety of setups with 12 reinforced tie outs. Tipping the scales at a hair under 2 pounds and made of polyester taffeta with a waterproof coating, this is a very durable tarp. It can be set up drum tight for the best resistance against wind. Comes with stuff sack in three size options but stick to a 12 foot for most hammocks. The bulwark is about the most protective tarp out there with its 13’ ridge and double cat cut edges. Made of polyester taffeta that is PU sealed on both sides of the fabric and treated for UV resistance. With a total of 16 edge tie outs and 3 more on the ridge, you can hang it any way you like and get it as tight as you need. With a total of 130 square feet of surface area to cover you, this will fit any tarp with ease. Of course, it isn’t the lightest at 2.4 pounds but for the size it works pretty well. Packs down to 4”x12 inches and comes with a stuff sack, guy lines, and stakes as a ready-to-go kit. This was the go-to tarp for the budget conscious before hammock gear became so widespread. Even after the introduction of dozens of different brands, this still stands up as an amazing tarp. Measuring 12’x10’ and weighing under 2 pounds is a great compromise for a bomb-proof poly tarp. Each side has 4 grommets that are offset allowing one side to be closed off. Point this upwind and you get a tarp that works year round. PU treated with double sealed seams and included over-large stuff sack round out an amazing deal for an entry level tarp. They say you get what you pay for and that is true with hammock camping but what you are usually paying for is weight reduction. While any of these tarps will work for three-season and some for four, you are going to have to spend more to carry less. Weight can be a big deal, ounces lead to pounds and pounds lead to pain. By all means, if you have the money buy lightweight but if you can get better coverage on your budget with something cheaper go for it. I used a Chinook tarp, which is still in perfect shape, for almost 8 years.